TopoWx (“Topography Weather”) is an 800-meter resolution gridded dataset of daily minimum and maximum air temperature for the conterminous U.S. The objective of TopoWx is to provide gridded temperature estimates that accurately capture both (1) locally relevant topoclimate spatial patterns; and (2) regional climate variability and trends. TopoWx gridded temperature estimates are based on historical daily station observations, digital elevation model (DEM) variables, atmospheric reanalysis data, and MODIS land skin temperature. Interpolation procedures include moving window regression kriging and geographically weighted regression. To better ensure temporal consistency, all input station observations are homogenized using the GHCN/USHCN Pairwise Homogenization Algorithm. TopoWx is provided in NetCDF-4 format, which can be read with a wide variety of open source and commercial tools. Bulk TopoWx data may be obtained via the SCRiM download server, which now serves as the primary home for TopoWx. Smaller spatiotemporal subsets can be obtained using the USGS data services listed below. TopoWx is licensed under a Creative Commons Attribution-ShareAlike 4.0 International License. It is provided as-is, without any warranty whatsoever. TopoWx is an open source project; the complete source code used to produce the dataset is managed and available through Github at https://github.com/jaredwo/topowx/. The 1948-2016 update of TopoWx was completed in July 2017 and is now available. Ongoing annual updates will regenerate the entire dataset, incorporating both new observations and model enhancements. This will result in a continuously improved dataset. However, different versions of TopoWx will be incompatible. For instance, data from the original 1948-2012 version should not be mixed with data from the 1948-2016 version. For specific questions on the update process or schedule, please contact TopoWx project lead Jared Oyler <jared.oyler@psu.edu>. Oyler, J.W., A. Ballantyne, K. Jencso, M. Sweet, and S.W. 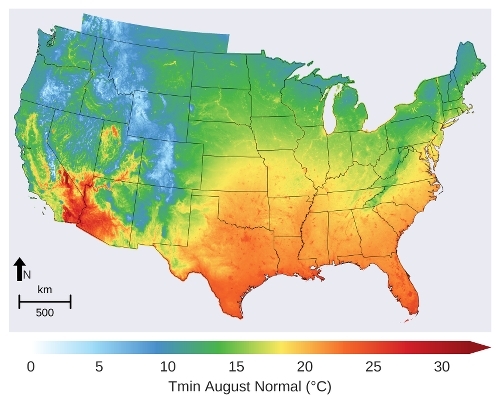 Running (2014), Creating a topoclimatic daily air temperature dataset for the conterminous United States using homogenized station data and remotely sensed land skin temperature. International Journal of Climatology, http://dx.doi.org/10.1002/joc.4127. Oyler, J.W., S.Z. Dobrowski, A.P. Ballantyne, A.E. Klene, and S.W. 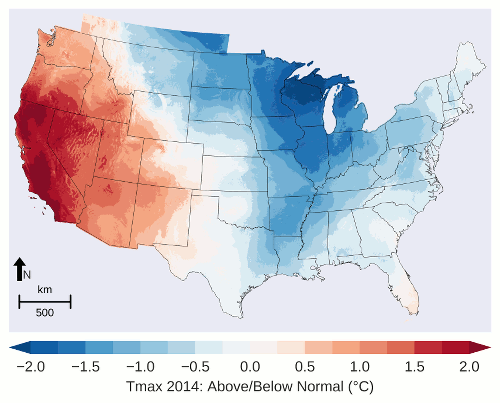 Running (2015), Artificial amplification of warming trends across the mountains of the western United States. Geophysical Research Letters, http://dx.doi.org/10.1002/2014GL062803. Oyler, J.W., S.Z. Dobrowski, Z.A. Holden, and S.W. Running (2016), Remotely sensed land skin temperature as a spatial predictor of air temperature across the conterminous United States. Journal of Applied Meteorology and Climatology, http://dx.doi.org/10.1175/JAMC-D-15-0276.1. Development of the current version of TopoWx was supported by the National Science Foundation through the Network for Sustainable Climate Risk Management (SCRiM) under NSF cooperative agreement GEO-1240507. Original TopoWx development was supported by the National Science Foundation under EPSCoR Grant EPS-1101342, the US Geological Survey North Central Climate Science Center Grant G-0734-2, and the US Geological Survey Energy Resources Group Grant G11AC20487.